Jacob Koppel Javits (May 18, 1904 – March 7, 1986) was an American politician who represented New York in both houses of Congress. He was a liberal Republican allied with Governor Nelson Rockefeller and fellow Senators Irving Ives and Kenneth Keating. After graduating from New York University School of Law, he established a law practice in New York City. During World War II, he served in the United States Army's Chemical Warfare Department. Outraged by the corruption of Tammany Hall, Javits joined the Republican Party and supported New York Mayor Fiorello H. La Guardia. He won election to the United States House of Representatives in 1946 and served in that body until 1954. In the House, Javits supported President Harry S. Truman's Cold War foreign policy and voted to fund the Marshall Plan. He defeated Franklin Delano Roosevelt Jr. in the 1954 election for Attorney General of New York, and defeated Democrat Robert F. Wagner Jr. in the 1956 Senate election. 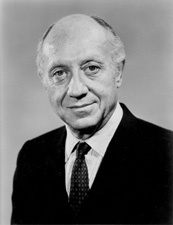 Javits won re-election to the Senate in 1962, 1968, and 1974. In the House and Senate, Javits established himself as a liberal Republican. He opposed the Labor Management Relations Act of 1947 and supported much of Lyndon B. Johnson's Great Society programs and civil rights legislation. He voted for the Gulf of Tonkin Resolution but came to question Johnson's handling of the Vietnam War. To rein in presidential war powers, Javits sponsored the War Powers Resolution. Javits also sponsored the Employee Retirement Income Security Act, which regulated defined-benefit private pensions. Javits lost the 1980 Republican Senate primary to Al D'Amato, who campaigned to Javits's right. Javits nonetheless ran in the election as the nominee of the Liberal Party, and D'Amato defeated Javits and Democratic nominee Elizabeth Holtzman. Javits died of amyotrophic lateral sclerosis in West Palm Beach, Florida in 1986. Javits was born to Jewish parents, Ida (née Littman) and Morris Javits, a janitor. Javits grew up in a teeming Lower East Side tenement, and when not in school he helped his mother sell dry goods from a pushcart in the street. Javits graduated in 1920 from George Washington High School, where he was president of his class. He worked part-time at various jobs while attending night school at Columbia University, then in 1923 he enrolled in the New York University Law School, from which he earned his J.D. in 1926. He was admitted to the bar in June 1927 and joined his brother Benjamin Javits, who was nearly ten years older, as partner to form the Javits and Javits law firm. The Javits brothers specialized in bankruptcy and minority stockholder suits and became quite successful. In 1933, Javits married Marjorie Joan Ringling. They had no children and divorced in 1936. In 1947, he married Marion Ann Borris, with whom he had three children. Deemed too old for regular military service when World War II began, Javits was commissioned in early 1942 as an officer in the U.S. Army's Chemical Warfare Department, where he served throughout the war, reaching the rank of lieutenant colonel. In his youth Javits had watched his father work as a ward heeler for Tammany Hall, and he had experienced firsthand the corruption and graft associated with that notorious political machine. Tammany's operations repulsed Javits so much that he forever rejected the city's Democratic Party, and in the early 1930s joined the Republican-Fusion Party, which was supporting the mayoral campaigns of Fiorello H. La Guardia. After the war he became the chief researcher for Jonah Goldstein's unsuccessful 1945 bid for mayor on the Republican-Liberal-Fusion ticket. Javits's hard work in the Goldstein campaign showed his potential in the political arena and encouraged the small Manhattan Republican party to nominate him as their candidate for the Upper West Side's Twenty-first Congressional District (since redistricted) seat during the heavily Republican year of 1946. Although the Republicans had not held the seat since 1923, Javits campaigned energetically and won. He was a member of the freshman class along with John F. Kennedy of Massachusetts and Richard M. Nixon of California. He served from 1947 to 1954, then resigned his seat to take office as New York State Attorney General. Throughout his career in Congress, in the House and later in the Senate, Javits was part of a small group of liberal Republicans who were often isolated ideologically from their mainstream Republican colleagues. One scoring method found Javits to be the most liberal Republican to serve in either chamber of Congress between 1937 and 2002. Although he frequently differed with the more conservative members of his party, Javits always maintained that a healthy political party should tolerate diverse opinions among its members. He rejected the idea that either party should reflect only one point of view. Javits liked to think of himself as a political descendant of Theodore Roosevelt's Progressive Republicanism. He was strongly committed to social issues, believing that the federal government should have a role in improving the lives of Americans. Yet as a lawyer who had for years represented business clients, Javits also advocated an economy in which business and government would cooperate to further the national welfare, instead of government regulating business too much, which he felt is what the Democrats supported. During his first two terms in the House, Javits often sided with the Harry Truman administration. For example, in 1947 he supported Truman's veto of the Taft-Hartley Bill, which he declared was antiunion. A strong opponent of discrimination, Javits also endorsed anti-poll tax legislation in 1947 and 1949, and in 1954 he unsuccessfully sought to have enacted a bill banning segregation in federally funded housing projects. Unhappy with the witch hunt atmosphere in Washington during the Cold War, he publicly opposed continuing appropriations for the House Un-American Activities Committee in 1948. Always a staunch supporter of Israel, Javits served on the House Foreign Affairs Committee during all four of his terms and supported congressional funding for the Marshall Plan and all components of the Truman Doctrine. In 1954 Javits ran for New York State Attorney General against a well-known and well-funded opponent, Franklin Delano Roosevelt, Jr. Javits's vote-getting abilities carried the day, and he was the only Republican to win a statewide office that year. As attorney general, Javits continued to promote his liberal agenda, supporting such measures as antibias employment legislation and a health insurance program for state employees. In 1956, Javits ran for U.S. Senator from New York to succeed the retiring incumbent Democrat Herbert H. Lehman. His Democratic opponent was the popular Mayor of New York, Robert F. Wagner, Jr.. In the early stages of that campaign Javits vigorously and successfully denied charges that he had once sought support from members of the American Communist party during his 1946 race for Congress. He went on to defeat Wagner by nearly half a million votes. Although his term began on January 3, 1957, he delayed taking his seat in the U.S. Senate until January 9, the day the New York State Legislature convened, to deny Democratic Governor W. Averell Harriman the opportunity to appoint a Democratic Attorney General. Thus, on January 9, the Republican majority of the State Legislature elected Louis Lefkowitz to fill the office for the remainder of Javits's term. Upon taking office, Javits resumed his role as the most outspoken Republican liberal in Congress. For the next 24 years, the Senate was Javits's home. His wife had no interest in living in Washington, D.C., which she considered a boring backwater, so for over two decades Javits commuted between New York and Washington nearly every week to visit his "other" family and conduct local political business. During his first term, he supported the limited 1957 Civil Rights Act, which was bitterly opposed by many of his southern colleagues. In foreign affairs, he backed the Eisenhower Doctrine for the Middle East and also pressed for more foreign military and economic assistance. Re-elected in 1962 and 1968, he supported Lyndon Johnson's civil rights measures and generally endorsed the Great Society programs. To promote his views on social legislation, he served on the Senate Labor and Human Resources Committee for twenty years, most of that time as the second-ranking minority member. Javits initially backed Johnson during the early years of America's involvement in the Vietnam War, supporting, for example, the Gulf of Tonkin Resolution in 1964. Also in 1964, Senator Javits joined David Rockefeller to launch the non-profit International Executive Service Corps which was established to help bring about prosperity and stability in developing nations through the growth of private enterprise. By the end of 1967, however, Javits was becoming disenchanted with the Vietnam war and joined twenty-two other senators  in calling for a peaceful solution to the conflict. In 1965 Javits appointed Lawrence Wallace Bradford Jr. as the Senate's first African-American page. In 1971, Javits appointed Paulette Desell as the Senate's first female page. By 1970, his rising opposition to the war led him to support the Cooper-Church Amendment, which barred funds for US troops in Cambodia, and he also voted to repeal the Gulf of Tonkin Resolution. Increasingly concerned about the erosion of congressional authority in foreign affairs, Javits sponsored the 1973 War Powers Act, which limited to 60 days a president's ability to send American armed forces into combat without congressional approval. Despite his unhappiness with President Richard Nixon over the Vietnam War, Javits was slow to join the anti-Nixon forces during the Watergate scandal of 1973-1974. Until almost the very end of the affair, his position reflected his legal training: Nixon was innocent until proven guilty, and the best way to determine guilt or innocence was by legal due process. His position was unpopular among his constituency, and his re-election in Watergate-tainted 1974 elections over Ramsey Clark was by fewer than 400,000 votes, a third of his 1968 margin of victory. During his last term Javits shifted his interests more and more to world affairs, especially the crises in the Middle East. Working with President Jimmy Carter, he journeyed to Israel and Egypt to facilitate discussions that led to the 1978 Camp David Accords. Javits served until 1981; his 1979 diagnosis with amyotrophic lateral sclerosis (also known as Lou Gehrig's Disease) led to a 1980 primary challenge by the comparatively lesser-known Long Island Republican county official Al D'Amato. D'Amato received 323,468 primary votes (55.7 percent) to Javits' 257,433 (44.3 percent). Javits' loss to D'Amato stemmed from Javits' continuing illness and his failure to adjust politically to the rightward movement of the Republican Party. Following the primary defeat, Javits ran as the Liberal Party candidate in the general election. His candidacy split the Democratic base vote with United States Representative Elizabeth Holtzman of Brooklyn and gave D'Amato the victory by a plurality of 1%. Javits received 11% of the vote. Javits died of amyotrophic lateral sclerosis in West Palm Beach, Florida, at the age of eighty-one in March 1986. In addition to spouse Marion Ann Borris Javits, he was survived by three children: Joshua, Carla, and Joy. He is interred at Linden Hill Jewish Cemetery in Queens, New York. Among those who attended the funeral were Governor Mario Cuomo, Mayor Ed Koch, former President Richard Nixon, Attorney General Edwin Meese, former Secretary of State Henry Kissinger, Senator Al D'Amato, Cardinal John Joseph O'Connor, former Mayor Lindsay, former Governor Hugh Carey of New York, and former State Attorney General Louis Lefkowitz. Also there were former U.S. Representative Bella Abzug of Manhattan; then Senators Nancy Kassebaum Baker of Kansas, Bill Bradley of New Jersey, Lowell Weicker of Connecticut, and Gary Hart of Colorado; banker David Rockefeller, The New York Times publisher Arthur Ochs Sulzberger, labor leader Victor Gotbaum, author Kurt Vonnegut, and actor Douglas Fairbanks, Jr.. Throughout his years in Congress, Javits seldom enjoyed favor with his party's inner circle. Few pieces of legislation bear his name, yet he was especially proud of his work in creating the National Endowment for the Arts, of his sponsorship of the ERISA Act, which regulated defined-benefit private pensions, and of his leadership in the passage of the 1973 War Powers Act. Javits used his office to advance ideas that furthered the policies even of Democratic presidents. In the fall of 1962 he proposed to a group of NATO parliamentarians that multinational corporations jointly create a new kind of investment vehicle to promote private investment throughout Latin America. He intended his idea to complement President John F. Kennedy’s Alliance for Progress. Two years later some 50 multinational corporations formed the Adela Investment Company much as Javits had proposed. The senator was generally considered a liberal Republican, and was supportive of labor unions and movements for civil rights. In an essay published in 1958 in the magazine Esquire, he predicted the election of the first African-American president by the year 2000. In 1964, Javits refused to support his party's presidential nominee, his conservative colleague, Barry M. Goldwater of Arizona. Senator Javits sponsored the first African-American Senate page in 1965 and the first female page in 1971. His liberalism was such that he tended to receive support from traditionally Democratic voters, with many Republicans defecting to support the Conservative Party of New York. Javits played a major role in legislation protecting pensioners, as well as in the passage of the War Powers Act; he led the effort to get the Javits-Wagner-O'Day Act passed. He reached the position of Ranking Minority Member on the Committee on Foreign Relations while accruing greater seniority than any New York Senator before or since (as of 2018[update]). He was also one of the main forces behind the Immigration and Nationality Act of 1965 that removed immigration quotas that favored Western European nations. Along with Dwight D. Eisenhower, he was among the first and most important statesmen in passing legislation promoting the cause of education for gifted individuals, and many know his name from the federal Jacob Javits Grants established for this purpose. Javits received the Presidential Medal of Freedom in 1983. New York City's sprawling Jacob K. Javits Convention Center was named in his honor in 1986, as is a playground at the southwestern edge of Fort Tryon Park. The Jacob K. Javits Federal Building at 26 Federal Plaza in lower Manhattan's Civic Center district, as well as a lecture hall on the campus of the State University of New York at Stony Brook on Long Island, are also named after him. The Jacob K. Javits Gifted and Talented Students Education Act of 1988 was named in honor of Javits for his role in promoting gifted education. The United States Department of Education awards a number of Javits Fellowships to support graduate students in the humanities and social sciences. The National Institutes of Health awards the Senator Jacob Javits Award in Neuroscience to exceptionally talented researchers in neuroscience who have established themselves with groundbreaking research. A 1983 US Congressional Act established these awards in honor of Senator Javits as a long time supporter of research into understanding neurological disorders and diseases. In his memory, NYU established the Jacob K. Javits Visiting Professorship in 2008. ^ "Minority Power: Jacob K. Javits: 1904-1986". March 17, 1986. ^ a b "Jacob Koppel Javits (1904-1986)". ^ a b "About - Javits Center". ^ a b c d e Pearson, Richard (March 8, 1986). "Former Senator Jacob Javits Is Dead at 81". Washington Post. Retrieved March 2, 2017. ^ "In his memoirs, he said he initially favored the effort in Vietnam and that he did not change his position until 1967." ^ a b c d Moynihan, Daniel Patrick. (March 11, 1986). "Special Report to New York". United States Senator from New York. ^ a b "Jacob K. Javits - Pensions & Investments". ^ Poole, Keith T. (October 13, 2004). "Is John Kerry a Liberal?". legacy.voteview.com. University of Georgia. Archived from the original on May 26, 2017. ^ a b c Michael S. Mayer (2009). The Eisenhower Years. p. 351. ISBN 1438119089. ^ J. Lee Annis (2016). Big Jim Eastland: The Godfather of Mississippi. ISBN 1496806158. ^ "Recess appointments" by the Governor in case of a vacancy in the offices of either the State Comptroller or the State Attorney General are now forbidden. To fill the vacancy, the State Legislature must convene, and elect somebody. See Art. V, § 1 State Constitution. ^ "Yes, Virginia, There are Liberal Republicans". May 12, 2009. ^ "Georgia House Dispute". Congressional Quarterly. 24 (3): 255. January 21, 1966. Retrieved March 27, 2017. ^ "Entitled To Express Views". The Courier-Journal from Louisville, Kentucky. January 16, 1966. p. 10. ^ Mann, Robert (2002). A Grand Delusion: America's Descent into Vietnam. Basic Books. p. 554. ISBN 0-465-04370-4. ^ & p.352: "... and joined 22 other senators ..."
^ "Frank Mitchell, the First 20th-century, African-American Page". history.house.gov. Office of Art & Archives at the House of Representatives. April 14, 1965. Retrieved March 1, 2017. ^ "Michael A. Johnson: Deputy Assistant Sergeant at Arms" (PDF). senate.gov. Oral History Interviews, Senate Historical Office. November 8, 2006. Retrieved July 22, 2017. ^ "War Powers - Law Library of Congress". ^ "Jacob Javits - Central Synagogue". "He also traveled to Israel and Egypt with President Carter, opening up discussions that ultimately led to the 1978 Camp David Accords." ^ "Jacob Javits Dies in Florida at 81: 4-Term Senator from New York". The New York Times. March 8, 1986. ^ a b c d Office of the Clerk (2009). Election Statistics. U.S. House of Representatives. ^ a b "New York State Plurality Was 165,459 for Reagan". New York Times. December 10, 1980. p. B24. Retrieved March 5, 2017. ^ Clarity, James F. (March 8, 1986). "Jacob Javits Dies in Florida at 81: 4-Term Senator from New York". The New York Times. Retrieved July 22, 2017. ^ Boyle, Richard; Ross, Robert (July 26, 2009). Mission Abandoned: How Multinational Corporations Abandoned Their First Attempt to Eliminate Poverty. Why They Should Try Again. Robert Ross. pp. 1–6. ISBN 0615317375. ^ Javits' successor, Al D'Amato, served 3 terms (18 years), and Chuck Schumer, if he completes his 2016 term in 2023, will tie Javits' record - 24 years. "Schumer topples D'Amato in New York Senate race". cnn.com. November 3, 1998. "Charles Schumer has bested three-term Sen. Alfonse D'Amato in New York's Senate race." ^ "Biography - U.S. Senator Chuck Schumer of New York". ^ "Jacob K. Javits Federal Building". Emporis GmbH. Archived from the original on April 14, 2016. ^ Russo, Charles J. (June 27, 2008). "Encyclopedia of Education Law". SAGE. Retrieved March 1, 2017 – via Google Books. ^ "Jacob K. Javits Fellowships Program". www2.ed.gov. U.S. Department of Education. April 23, 2014. Retrieved July 22, 2017. ^ "Javits Neuroscience Investigator Award (R37)". ninds.nih.gov. National Institute of Neurological Disorders and Stroke. July 7, 2006. Archived from the original on July 30, 2009. ^ "NYU Lecture on the plight of Syrian Refugee Children". United States Congress. "Jacob Javits (id: J000064)". Biographical Directory of the United States Congress. Wikimedia Commons has media related to Jacob K. Javits.